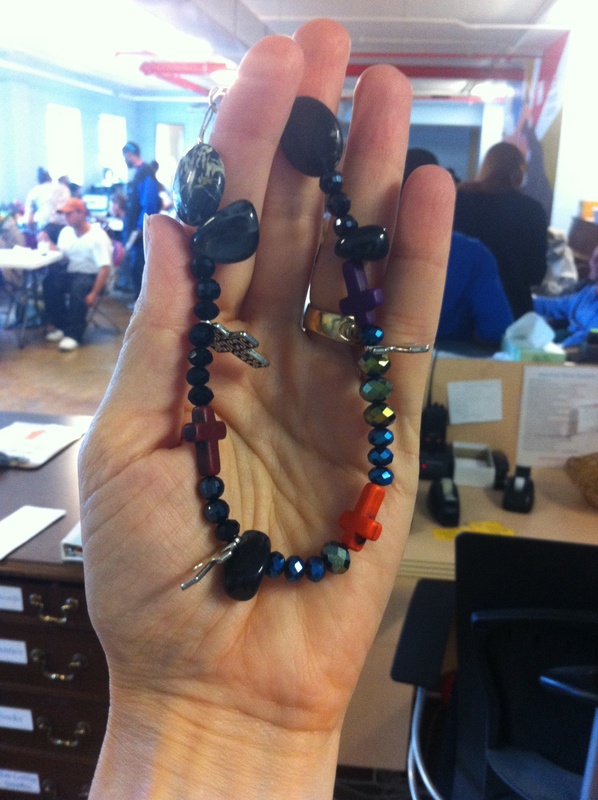 Once a week, I volunteer at a center that serves women and men who are homeless or extremely poor. I’ve been involved in one way or another with the place for more than a decade, but I still get surprises every time I go…or maybe not so much surprises as reminders. The first reminder is that there is no typical homeless person. I saw a man who looked like the stereotype–long hair held back with bandana, unshaved face, raggedy jeans–and another who looked for all the world like a physician, with bifocal glasses, a tweed jacket, and a gentle demeanor. The second reminder was how generous people who are poor can be. They will pray for you, ask how you are doing, and help their friends in just about any way imaginable. They will tithe out of the paltry sums they get from minimum wage jobs or Social Security checks. Today, as I collected meal tickets, one of the regulars–a woman who carries her tiny dog around in her jacket–gave me a beaded bracelet. I knew better than to turn it down–accepting the generosity of others is a lesson learned early in this business. The bracelet sat on the desk next to me as I did my work. Just about everyone commented on and admired it. Before I left, I passed it along to another woman at the center that day. She needed a pick-me-up. The third reminder is that the rules are different for people who live on the streets. They can’t be fully themselves. The woman who reminded me of this spent a good deal of the morning on the phone with a lawyer; she was getting help to keep custody of her kids. She got teary telling me about her situation–and who wouldn’t–but then she said, “No tears. Tears are a sign of weakness. Gangsters don’t cry.” I looked at her; she was not a gangster. “You can’t show weakness on the street,” she said. And, of course, she is right. The last reminder for today was that shelter is more than a roof over your head. I live in a home that is safe and with people who will care for me if I am sick or in trouble. That is a gift. But it is also a gift to be with people who have very little. It is a cliche that they remind us of how lucky we are. Sure, sure. Being with people in extreme poverty also reminds me of how completely human it is to fear your own vulnerability even as you protect those around you who are vulnerable. The poor folks I have met remind me not only of what I have that sets me apart, but what we all have that brings us together. Sometimes, the people who make up your community are a kind of shelter, too. They give you a place to feel safe and they care for you when you are sick or in trouble. They won’t take advantage if you shed a tear. Sometimes, they will even give you a little bling for no reason at all. This entry was posted in Lessons, Spirituality and tagged gratitude, homelessness by Mary Keenan. Bookmark the permalink.